ARLEE – Jerry McGahan, an Arlee artist, writer, beekeeper, husband, father and friend, left this world Monday, Oct. 3, 2016, in the house that he built, on the land that he loved for almost 50 years. He died the way he slipped out of a party – quietly, and well before anyone wanted him to. He was 73 years old. Jerry was born in Dillon in 1943. When he was 5, his family moved to Livingston, where his mother and stepfather ran a diner called The Coffee Shop. Jerry spent his free time outside, fishing and clambering up the mountains of Paradise Valley. As a boy, he and two friends scaled Emigrant Peak – in sneakers. He climbed in town, too, to the top of every building in Livingston. Atop one building, he found a fledgling pigeon in a nest. He took the bird home and named it Sapphire. When Jerry would deliver the Park County News around town, Sap came with him, perched on his cap. So began a lifelong love of birds. In high school, Jerry earned money by selling pelts of animals he trapped in a creek bottom near town. Running that trap line, in the dead of winter, when his car iced over and the snow piled deep, he learned his body could do things his mind didn’t think possible. That mental fortitude would fuel remarkable achievements for the rest of his life. It would also help him survive dangerous scrapes like capsizing his boat while goose hunting one winter on the Flathead River. Jerry earned bachelor’s and master’s degrees in zoology at the University of Montana, where he was a member of Sigma Alpha Epsilon. He studied golden eagles, and he kept one, too. It lived on top of Mount Sentinel, and he trained it to fly to him when he blew a referee’s whistle. He was in class one day when someone came looking for him. The Grizzly football team had been practicing nearby and the eagle, drawn to the coach’s whistle, had swooped down and perched on the ball. No one dared reclaim it, and a photograph of the eagle and the puzzled players appeared in the Missoulian the next day. Jerry graduated in 1965 and married his first wife, Libby Sale, in 1966. They spent that summer in Yellowstone, where Jerry helped the late John Craighead with a grizzly bear study. During that study, Jerry pulled a pre-molar from the jaw of a boar grizzly to gather data on aging techniques. When he got back to the truck, his partner realized that the bear had hardly been tranquilized and could have awoken at any moment. Jerry and Libby moved to Madison, Wisconsin, where Jerry got a Ph.D. in zoology. He finished his degree in South America with a two-year study on Andean condors in Colombia and Peru. He filmed a documentary about the cultural and biological significance of the birds and wrote a story about them for National Geographic. Libby took the photographs. He’s on the cover of the May 1971 issue. A giant condor named Gronk is alighting on his arm. Jerry retired from academia, moved back to Montana and took up beekeeping in Arlee. He’d bought 60 acres of river-bottom land and moved a cabin onto the property. The ground was overgrazed and barren, with little topsoil. But it would become his masterwork – many years of daily labor transformed it into a sylvan oasis of fruit trees, rock gardens, vegetable plots and flowers. It’s a refuge to all who visit. Jerry and Libby divorced in 1980. The next year he married Janet, his wife of 35 years. She was his hiking partner, editor and love of his life. He marveled at her beauty and strength and loved her fiercely until the day he died. He also cherished a close friendship with Janet’s first husband, Scot Crawford, a man he respected and admired. Jerry worked many jobs to support his family. 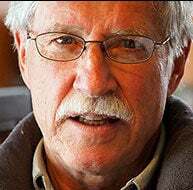 He taught biology and math in St. Ignatius, conducted a biological survey of the Blackfoot River valley for the Nature Conservancy, and was a state bee inspector. All summer he worked his bees with his family. Janet delivered their Old World Honey to the Good Food Store, the Shack and other Missoula establishments. In the winters, while the bees slept, Jerry and his family piled into an old Subaru and drove to Mexico, where they camped on the beaches of the Sonoran Desert. When Jerry faced a gargantuan task, he’d chip away at it, little by little, day by day, until it was done. He moved mountains this way. It’s also how he wrote. His published work includes two novels, “A Condor Brings the Sun,” (Sierra Club, 1996) and “Songs for a River,” (Knut House Press, 2016); a collection of short stories, “The Deer Walking Upside Down,” (Schaffner Press, 2015); and short fiction in The Georgia Review, Ploughshares, Gray’s Sporting Journal, and others. Jerry kept track of the moon. He liked more pepper on his eggs than most. He fixed the old before he bought the new. A man of routines, Arlee residents could set their watches to his morning walk to the post office, with his pink backpack slung over his shoulders and his dog by his side. And almost every evening, for more than 35 years, he played cribbage with his best friend of 68 years, Jay Sumner. Jerry was a lifelong appreciator of beauty in the human and natural world. He photographed it when he saw it and painted it on canvas. He was a believer in the human spirit, and his sole complaint of humanity was its tendency to sing “Happy Birthday” a little too slowly for his taste. One of Jerry’s greatest gifts was his contagious excitement about the world around. It was a singular pleasure to tell him about an encounter with something wild in the woods. The only currency he put much stock in was a good story, and by that measure, he died rich. Advanced prostate cancer finally felled this man who little else could fluster. He is survived by his wife, Janet; his lifelong friend, Jay Sumner; his siblings, Melody Schreder, Mac McGahan and Wesley Harr; his children, Jay, Jordan, Simon, Duncan, Romy and Hilly; 18 grandchildren; two great-grandchildren; his hunting partner, David Rockwell, and his loyal lab, Annie. He died where he lived – next to his wife, Janet, and facing his gardens, within earshot of the Jocko River. Few were happier to be alive than he. Indeed, few were more alive.